Can Natural Killer Cells Wipe Out Childhood Cancer? The American Family Children's Hospital Pediatric Hematology, Oncology and Bone Marrow Transplant specialists in Madison, Wisconsin have special expertise in using immunotherapy to treat children with cancer. 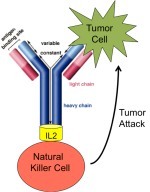 Immunotherapy uses components of the immune system, such as antibodies or certain types of white blood cells, to fight cancer. In addition, certain medications can be administered to patients in order to stimulate the immune system and improve its ability to kill cancer cells. Strong basic laboratory research programs have led to active clinical trials using immunotherapy to treat neuroblastoma and other pediatric cancers.